Giant Wild Goose Pagoda or Big Wild Goose Pagoda. Xi'an. Tours to China. Legend tour. 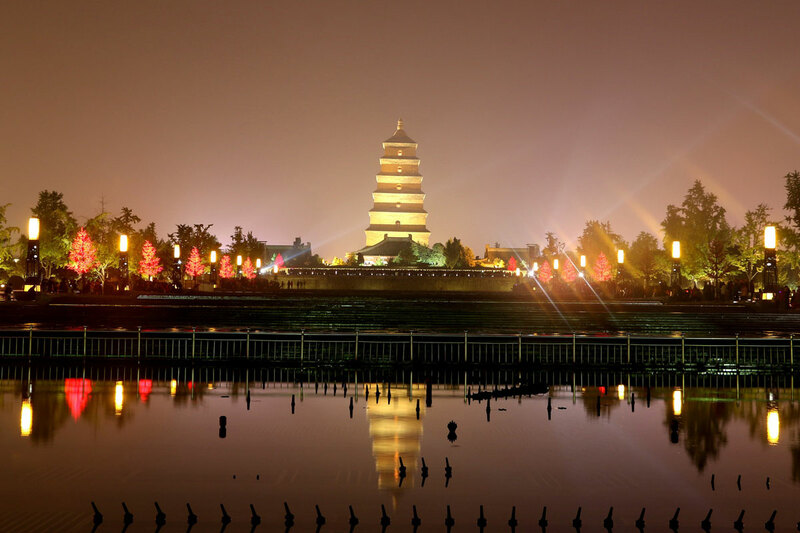 Situated in the Da Ci'en Temple, about four kilometers from the urban center, the Big Wild Goose Pagoda is one of the most famous Buddhist pagodas in China. Originally built in 589 A.D. in the Sui Dynasty, the temple was named Wu Lou Si Temple. It was not until 648 A.D. when Emperor Li Zhi, then still a crown prince, sponsored a repair project on the temple. This was a symbol of thanksgiving to his mother for her kindness, after she had suffered an early death. The temple then assumed the present name Temple of Thanksgiving. The Emperor Gaozong was said to pay homage to the temple twice a day by looking in its direction from the Hanyuan Palace. The temple, with 13 separate courtyards, contained 1,879 magnificent-looking rooms altogether and was a place of grand extent in the Tang Dynasty. However, it went into gradual decay after the downfall of the Tang Dynasty. The halls and rooms that have survived the ages are structures that were built in the Ming Dynasty. The Tang Regime gave orders to build a chamber for the translation of Buddhist scriptures in an effort to have the then widely renowned Master Xuanzang (Monk Tripitaka) agree to be the head of the temple. 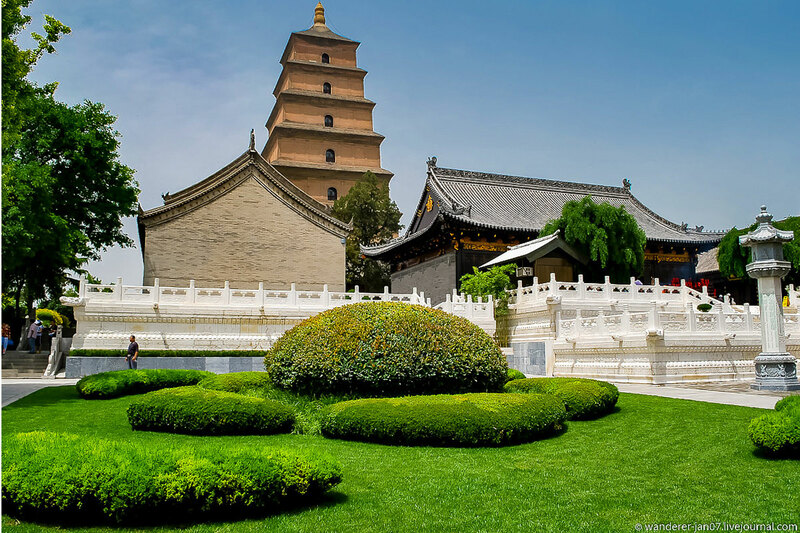 The Wild Goose Pagoda was finished in 652 A.D. Its five stories are 60 meters in height. The decay of the earth-cored pagoda caused the new construction of a 10-storey pagoda from 701 to 704. However, the winds of war in the years to come, reduced the pagoda almost to ruins, which in turn resulted in the construction of a 7-stored, 64-meter-high structure today. The storied pagoda was an architectural marvel. It was built with layers of bricks but without any cement in between. 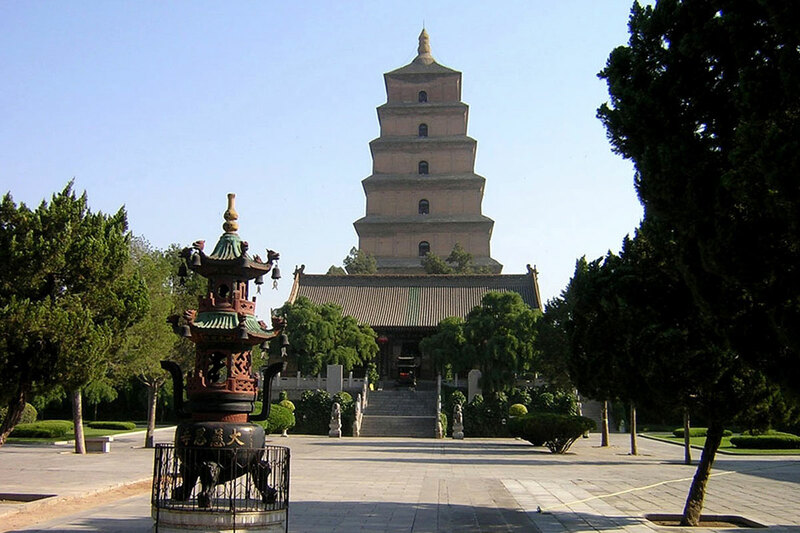 The bracket style in traditional Chinese architecture was also used in the construction of the pagoda. The seams between each layer of bricks and the " prisms' on each side of the pagoda are clearly visible. 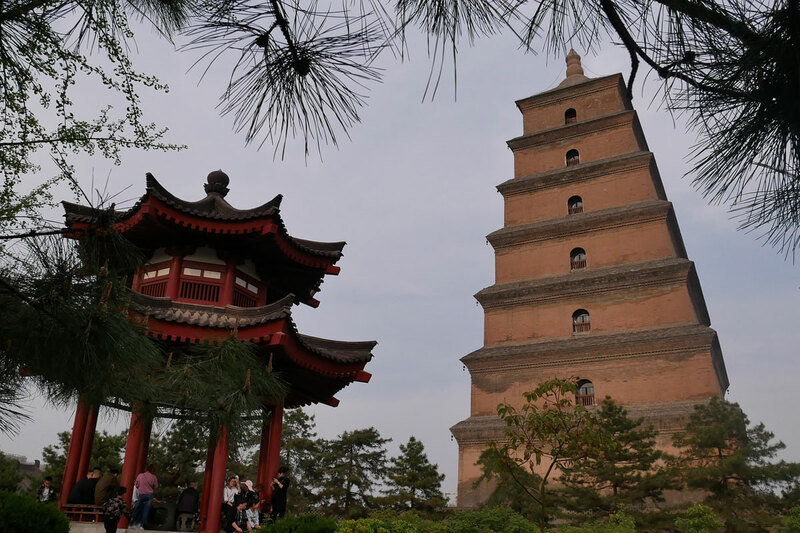 The grand body of the pagoda with its solemn appearance, simple style and high structure, is indeed a good example of ancient people's wisdom and talent.